The twenty-first alpha version of 0 A.D., a free open-source RTS game of ancient warfare, was released one day ago. And the PPA repository is ready for Ubuntu 16.04, Ubuntu 16.10, Ubuntu 17.04 and their derivatives. 0 A.D. Alpha 21 “Ulysses” features new game modes, plenty of new maps, the official introduction of the final civilization: The Seleucid Empire and more! See the announcement for more details. 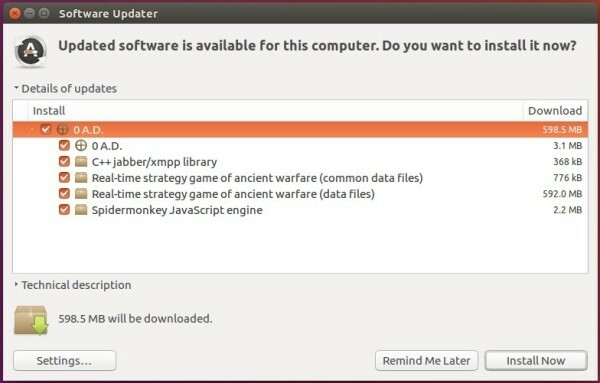 The official 0 A.D. PPA just built the new release a few hours ago, available for Ubuntu 16.04, Ubuntu 16.10, Ubuntu 17.04, and Linux Mint 18, Elementary OS Loki, etc. 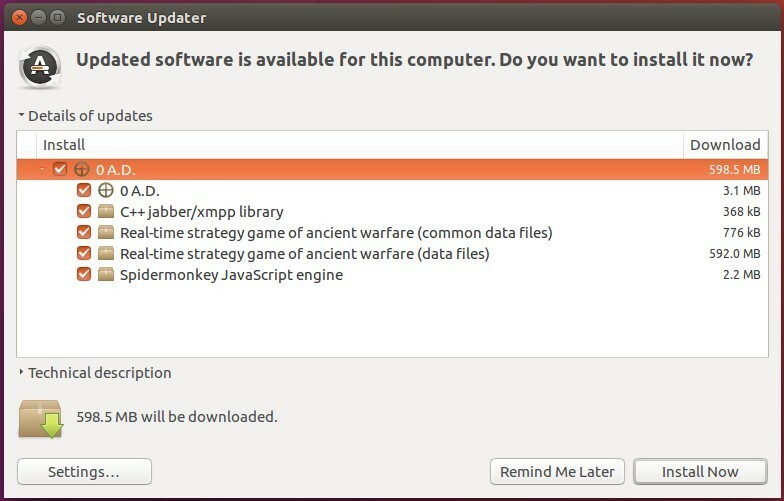 To remove the game, use Ubuntu Software or Synaptic Package Manager. 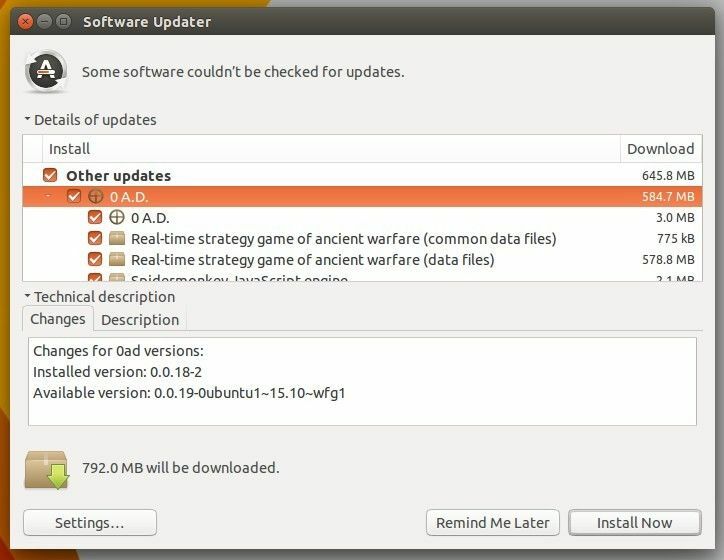 The PPA can be removed via System Settings -> Software & Updates -> Other Software tab. The nineteenth alpha version of 0 A.D., a free, open-source game of ancient warfare, was released yesterday. PPA’s ready for Ubuntu 16.04, Ubuntu 15.10, Ubuntu 14.04, and Ubuntu 12.04. 0 A.D. Alpha 19 named ‘Syllepsis’. It features new victory modes, a ceasefire game mode, attack coordination, 3 new skirmish maps, new animals, visual replay, and eight times maximum map height support. See release note. There’s an official PPA repository for all current Ubuntu releases and derivatives. Follow below steps to add PPA and install the game. Type in your password when it asks, no visual feedback so just type in mind, and hit Enter to continue. 2. Install or Upgrade the game. remove the PPA via Software & Updates -> Other Software tab and remove the 0 A.D. using Software Center. Stendhal is a fun friendly and free multiplayer online adventure game developed using the Arianne game development system. 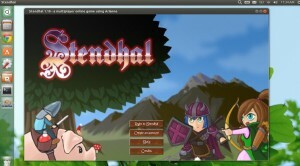 This tutorial shows you how to install & play this game in Ubuntu 13.04 Raring, Ubuntu 12.10 Quantal, Ubuntu 12.04 Precise, Ubuntu 10.04 and their derivatives such as Linux Mint and Elementary OS. For Linux Mint user, read this post to add playdeb repository. Once installed, start it from the Unity Dash.